I freaked out a little when I saw Arcee’s 22-step instructions, so you can imagine my reaction to seeing Bumblebee’s 28-step ones. Luckily, his transformation is almost as simple and intuitive as Arcee’s. Bumblebee’s transformation is pretty straight-forward and what we’ve come to expect for Bumblebee sports cars and car-type Transformers in general. I can transform him either way in about two minutes, but you may be faster than I am. The light-piping on Bumblebee really works excellently and is one of the best features of the toy. 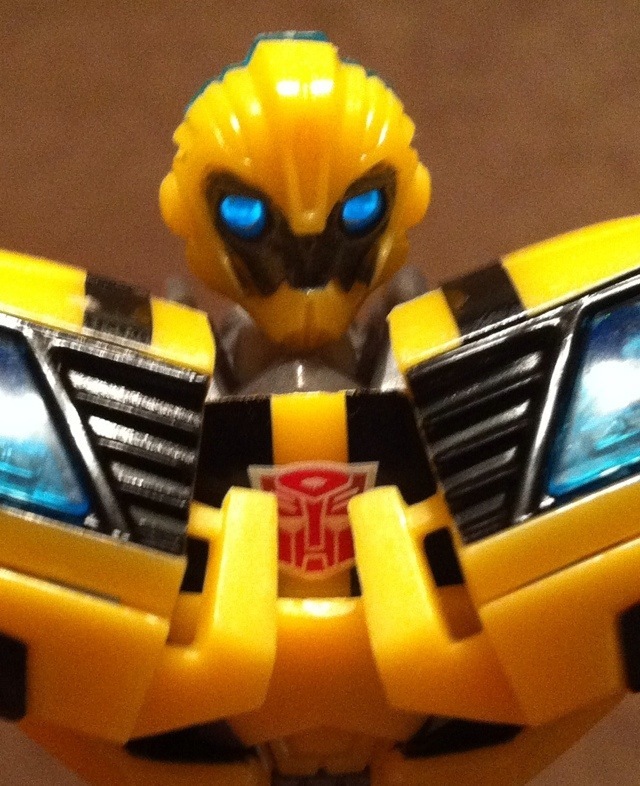 I love that Hasbro has started incorporating pupils into the light-piped eyes, as it really adds some humanity and emotion to the Transformers’ faces. Maybe it’s just that I’m totally burnt-out on the look of movie Camaro Bumblebee, but I really enjoy the stylized appearance of Bumblebee’s sports car alt-mode here. While not perfectly authentic to his cartoon appearance, I think the car mode is pretty darn close. As part of the inaugural wave of “First Edition” Transformers Prime deluxes, Bumblebee’s package has “First Edition” written in foil-etched lettering going down the side of the package. It looks fairly snazzy if you’re a packaged collector, but if not, you probably don’t care. Bumblebee also includes a generic cardboard Transformers Prime display stand. I guess it’s good enough for a freebie, but I’m not really likely to ever to set Bumblebee on this stand instead of in a diorama with other toys. 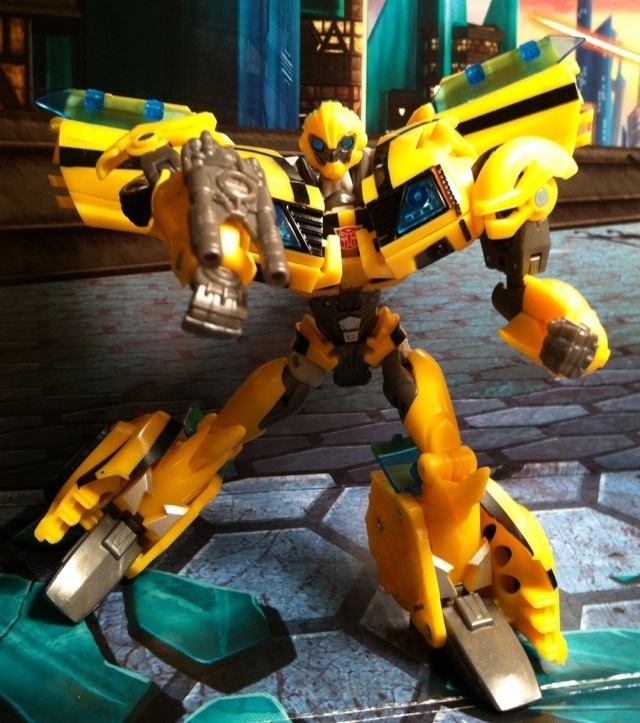 For a weapon, Bumblebee includes one double-barreled blaster that can clip onto either of his arms. It’s simple, looks good, fits tightly and can be stored in alt-mode as part of his undercarriage. I wouldn’t have minded having an extra blaster so Bee could have one for each arm, but I won’t lose any sleep over it either. I voiced my disappointment in some of the missing paint detail in my Transformers Prime Arcee review, but she’s like Palisades Toys’ best-painted Muppet figure compared to Transformers Prime Bumblebee. Hasbro seriously cheaped-out on the paints applications for this toy. The paint apps are so few on top of the molded-yellow plastic to the point where you might think this a bootleg if you didn’t know better. Bumblebee’s head is supposed to be primarily yellow with black highlighting as a secondary color all around it and a dash of red, but instead his head is just yellow. He’s missing lots of black detailing on his arms, he’s missing lots of black on this legs, and he’s missing silver on his feet. Even the headlights are the wrong color, being blue instead of clear. Instead of giving us a cardboard display stand and fancy foil printing on the package that said “First Edition”, this toy would have benefited immensely from Hasbro spending a few pennies on some black paint. While not nearly as weak as the paints, the mold for this toy is also pretty lacking. 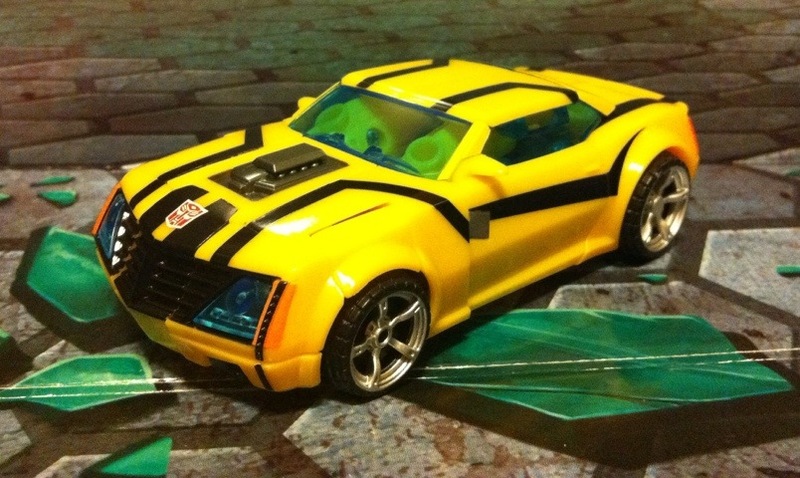 The hood becomes Bumblebee’s chest as you’d expect, but the chest panels don’t lock into place in any usual manner for a car Transformer. Instead, there are these grey pegs that the chest panels are supposed to rest on so as to not inhibit articulation, but instead the chest is incredibly unstable and came unhooked or misaligned every time I moved him around. Making matters worse, even if the chest stayed in place, it still wouldn’t be screen-accurate. 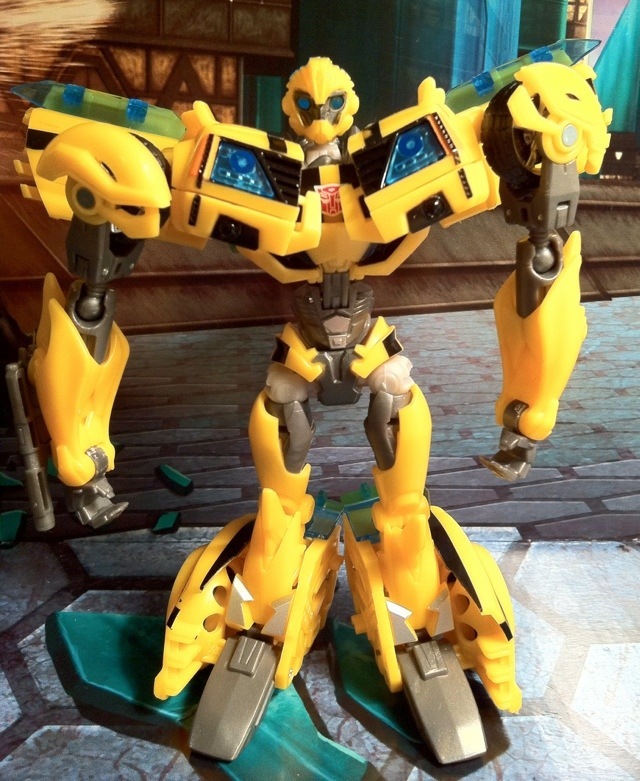 The Transformers Prime Bumblebee model has a chestpiece that looks like one solid piece, whereas the toy’s chest plates are engineered to sit at angles with a huge gap in the middle. In addition, the doors are hanging off the back of Bumblebee at the wrong angle, which looks awkward. 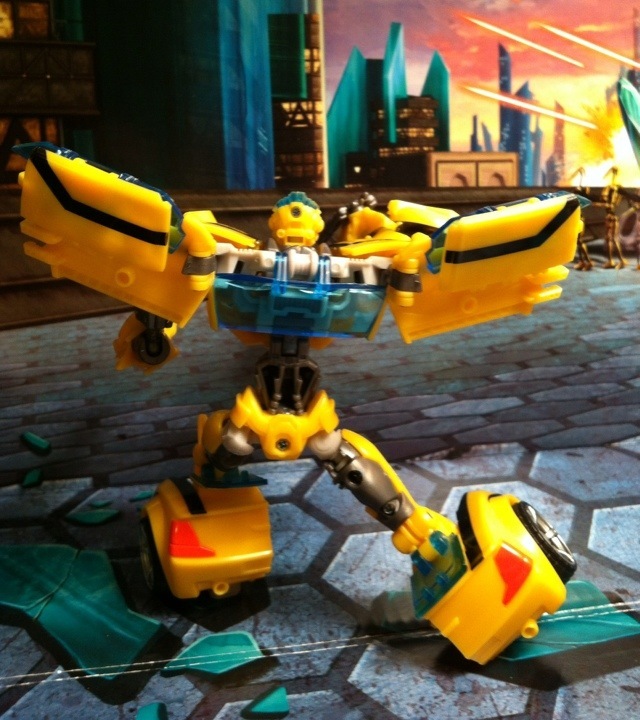 The result of these issues is a clearly inaccurate Transformers Prime Bumblebee mold. 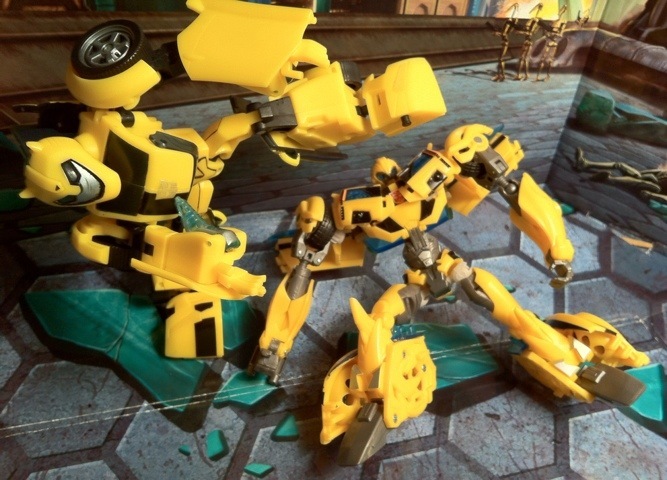 Allegedly, the lower bumper parts of Bumblebee’s chest are meant to fold downward. I say “allegedly” because although I see the step in the instructions where this is intended to happen and the seams in the mold where you’re supposed to fold the pieces, no amount of force or prying I’ve placed on either side has enabled me to fold those portions downward. It’s possible that I could force them down with the jaws of life, but I’m not willing to risk shattering the toy to find out. I don’t know if these pieces worked properly or not on the NYCC Taxi Bumblebee, but they don’t work here. Finally, the articulation on this guy is not the best. The ball-joints on his hips are a great asset, as without them him legs movement is extremely restricted by all the car parts on his legs. In addition, the loose chest panels and shoulders make posing his upper-body a pain, and the lack of a wrist joint makes achieving a shooting pose that looks good impossible. Bumblebee has a lot of points of articulation, but the engineering of the toy doesn’t allow him to utilize this potential. 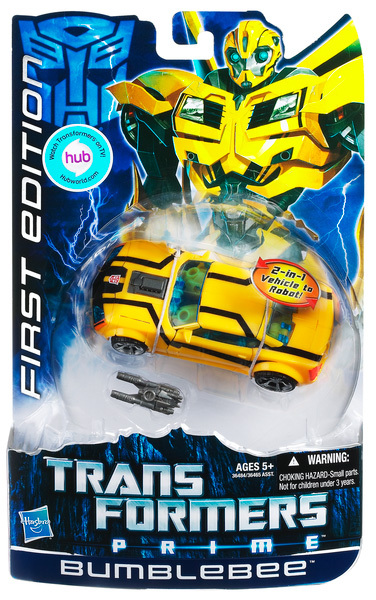 BigBadToyStore has Bumblebee for $10.99 individually (2 bucks + tax less than Toys R Us! ), as well as a set of 3 available with Arcee, Starscream, and Bumblebee for $44.99. CMDStore also has Bumblebee and all the other Transformers Prime toys available for pre-order. Amazon has Transformers Prime Bumblebee available from a variety of sellers, although the stock status and prices are changing frequently. 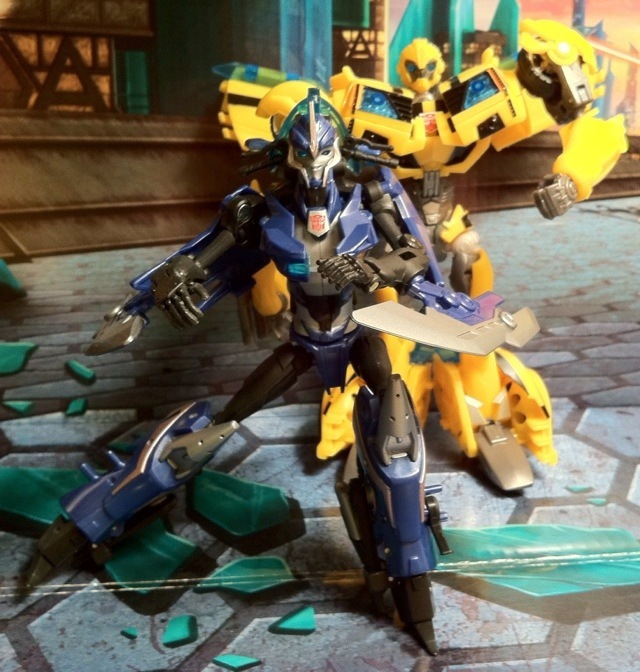 Overall: Transformers Prime Bumblebee is far from the worst Transformers toy in recent years, but it’s certainly in a lower-echelon than the Transformers Classics and Transformers Animated lines. The paint apps are underwhelming, the mold isn’t screen-accurate enough, the toy is lacking in tightness and stability, the lower bumpers don’t work properly, and the articulation is poor and makes finding good poses for him nigh-impossible. Most damning is that he’s so floppy and unstable in robot mode that he just isn’t fun to play with. The light-piping in the head works terrific and I like the (inaccurate) look of Bumblebee’s sports car mode, but that’s about where my good will towards this guy ends. I bought Bumblebee because I need him for my Prime display of Autobots, but if you don’t want him for that same reason and aren’t a Bumblebee enthusiast, I don’t recommend him. Love this review? Hate it? Bored to tears by it? 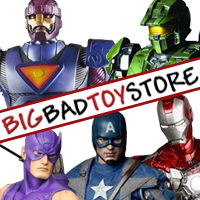 Want reviews of different toys or lines? Leave a comment and tell me so! I want to get better at writing reviews for you, dear readers! Hit the “Leave a comment” button and give me a piece of your mind! 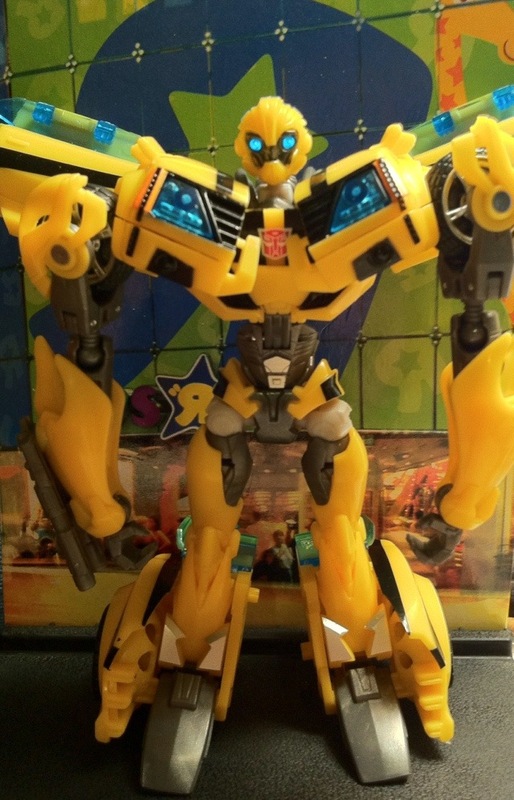 This entry was posted in Collecting, Reviews and tagged bumblebee, Hasbro, Toy, Toy Review, Transformers, Transformers Prime. Bookmark the permalink. same thoughts on your review the only thing that keeps me from buying this figure is for collecting all the TF Prime figs.